Understanding how Google treats link disavowals and implements linking penalties will help you audit and clean up your backlink profile more efficiently. Webmaster trends analyst John Mueller recently held a Hangouts session clearing up some of the most common misconceptions about the way link disavowals and penalties work. Let’s go over some of the highlights and dispel some common misconceptions involving your link profile. Misconception 1: Multiple reconsideration requests reduce your chances of re-inclusion. 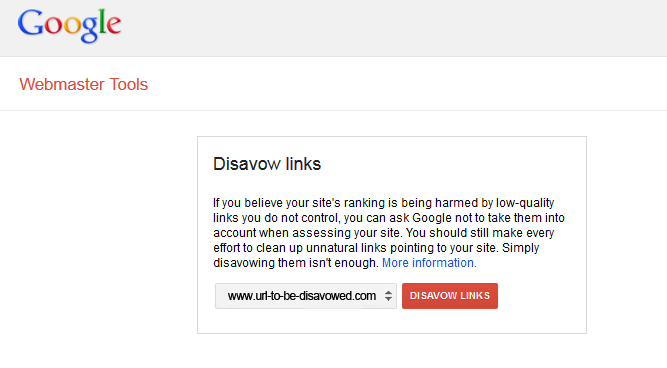 Misconception 3: Submitting the text-based Disavow file is enough. Misconception 4: Disavowing pages (not entire domains) is enough. Misconception 5: You shouldn’t focus on just the links on Google Webmaster Tools. The Truth: Keep sending in those reconsideration requests and cleaning up your links! Google does not look at multiple reconsideration requests negatively. They consider each request independently, so don’t be afraid of looking like a bad website that consistently gets even worse backlinks. Think of it as you consistently showing the initiative to clean up your site. The Truth: According to Mueller, Google does not keep a record at all. It’s important for you to keep a record of links you’ve disavowed in the past, because you will have to include them whenever you upload a new disavowal file. Do not remove these previously disavowed links; otherwise, you might need to clean up your backlink profile again from scratch. The Truth: Remember the requirements of link disavowal – you only do it as a last resort type of solution after you’ve done everything you can to contact or find the contact information of the owners of the bad websites linking to you. While not completely required, it would do you good to send a link – a spreadsheet, tracking sheet, or other information – that shows you tried your best to get in touch with the webmasters before you sent the Disavow request. This will help facilitate your request faster. The Truth: This depends. Sometimes, it’s enough to disavow a link from a single page on a website. There will be times, however, that the links will be duplicated on other pages, and you’ll need to find and disavow these too before you see improvements in your rankings. The danger in disavowing entire domains is losing credible backlinks that you may have built on its other pages. A good solution would be to search for your brand name or any anchor texts you remember building in that domain. You can do a broad brand name search or be more specific with the site: command. The Truth: This is both true and a misconception. It’s the latter, because the links that appear on Google Webmaster Tools are a good working start to clean up your link profile. It’s the former, because when you start digging deeper, you may find other examples that display a linking pattern not picked up by Webmaster Tools. Pay attention to any signs that you may see that will require you to clean up your link profile. These are just some highlights of Mueller’s discussion. To understand more about disavowing links and link penalties, make sure to watch the entire session below, or talk to your account manager today for assistance. You can also have us clean up your campaigns’ link profiles and request to disavow links through our SEO reseller program. If you’re not yet our partner, remember to sign up today to request your website audit. Keep checking back for more updates and tips!